For a chemical emergency, call CHEMTREC at 800-424-9300. For a complete listing of information on PERACIDIN™ Dialyzer Reprocessing Concentrate, call 800-726-2308. It is important to read and understand all of the Instructions For Use prior to using PERACIDIN™ Dialyzer Reprocessing Concentrate. For a complete listing of information on PERACIDIN® RO Disinfectant, call 800-726-2308. 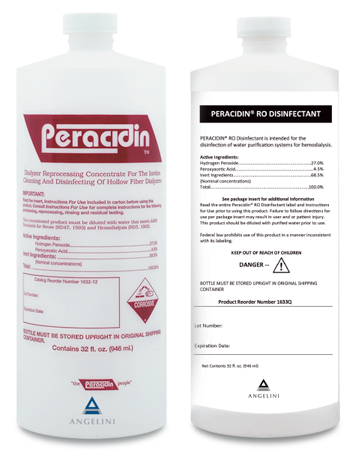 It is important to read and understand all of the Instructions For Use prior to using PERACIDIN® RO Disinfectant.